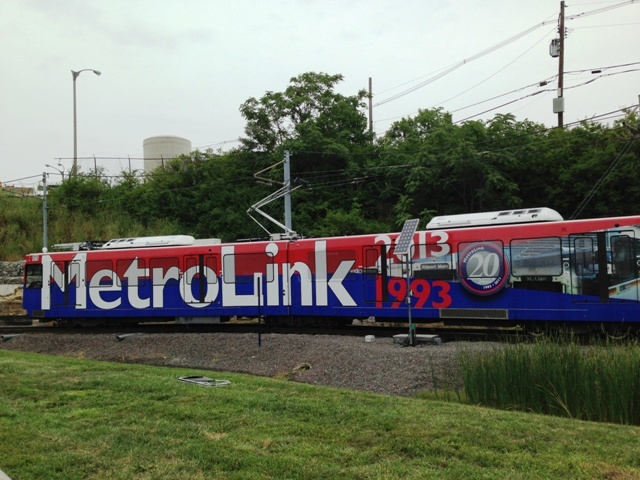 MetroLink will officially turn 20 years old on July 31. 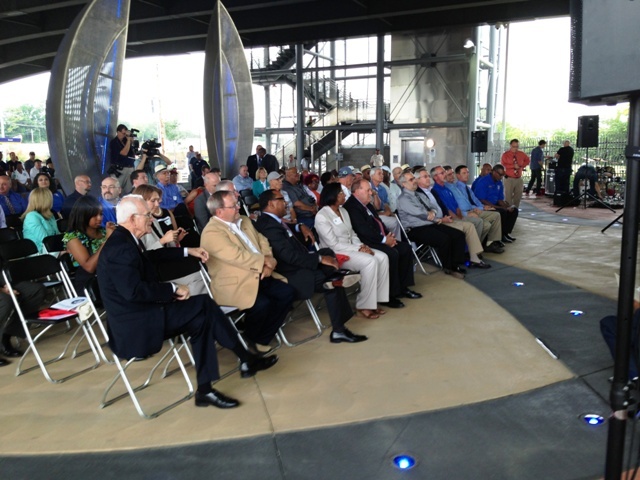 Today St. Louis County Executive Charlie Dooley, St. Clair County Board Chairman Mark Kern, former U.S. Congressman Jerry Costello from Illinois, a representative for St. Louis Mayor Francis Slay, and former Bi-State Development Agency Executive Director Jack Leary joined Bi-State Development Agency/Metro officials, employees, retirees, former employees, and others to celebrate the milestone at Scott Avenue Transit Plaza at the Grand MetroLink Station in St. Louis. The event, which was open to Metro customers and members of the general public, kicked off with Bi-State Development Agency (BSDA/Metro) President and CEO John Nations, Chairman of the Bi-State Development Agency Board of Commissioners David Dietzel along with Dooley, Kern, Costello and others arriving at the Grand Station on a 20th anniversary commemorative, specially wrapped MetroLink train. The first phase of MetroLink officially opened on July 31, 1993 with a 14-mile stretch from North Hanley in North St. Louis County to 5th and Missouri in Illinois. Today, the light-rail system has 37 stations, stretching 46 miles, connecting citizens traveling between Lambert-St. Louis International Airport, Shrewsbury, Missouri, downtown St. Louis and communities as far east as Scott Air Force Base near Shiloh, Illinois. Over the past two decades, the light-rail system has carried an estimated 300 million riders. Commuters currently rely on MetroLink for transportation to employment centers, recreational and entertainment venues, health care institutions and other important destinations across St. Louis City and St. Louis County and the Metro East. Over the past 20 years, MetroLink has also served as a catalyst for economic development in the region, with an estimated $2 billion in residential and commercial development projects already complete around the alignment and other plans for development underway. Among the successful existing transit oriented developments are the Meridian near the Brentwood I-64 MetroLink Station, the Emerson Park development in East St. Louis, and, most recently, the Mercantile Exchange development in downtown St. Louis. Over the years, continued operational improvements have also enhanced service for MetroLink customers. Recent projects include the Scott Avenue Transit Plaza at the Grand MetroLink Station, and the installation of the UMSL South Interlocking and the East Riverfront Interlocking. The East Riverfront Interlocking was an essential component before a three-year project could get underway to refurbish the historic Eads Bridge superstructure and rail deck so it can serve as a vital bi-state link for at least 50 more years. “The last two decades have been successful for MetroLink, and with the light-rail system playing such a critical transportation role in our community, we are committed to doing all we can to ensure it continues to be a success story for our region,” noted Nations. The anniversary celebration will continue through the weekend, with live music performed onboard the specially wrapped 20th Anniversary train to entertain passengers between 1 p.m. and 3 p.m. on Saturday, July 27 on the MetroLink Red Line and Sunday, July 28 on the MetroLink Blue Line. Volunteer Metro employee Ambassadors are scheduled to hand out 20th Anniversary MetroLink train banks to customers on the music train during the concerts as a commemorative token. Click here for more information and schedules for the MetroLink 20th anniversary live concerts on the train.